Surprises and Stir-Frys | Run, Lindsay, Run! It’s funny how quickly our moods or feelings can change– I really surprised myself yesterday. I just posted about how last week was pretty terrible running and energy-wise. Thank you for all your comments and well wishes! I got the test on Tuesday evening and survived despite my extreme phobia of all things blood/needles. I am hoping to get the results back tomorrow but we may have to wait and see. I have been feeling a bit better lately, so I attempted a tempo run last night after work. I wanted to run off feel instead of working off a certain pace goal, so I picked a new route I’ve been meaning to try so there would be no basis of comparison to a prior workout if it was going sub-par. 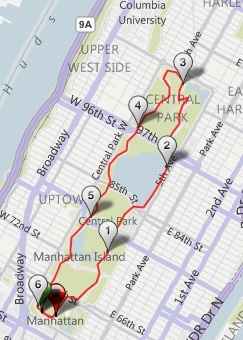 I decided to run one entire counter-clockwise loop of Central Park. I thought this was 6.2 miles but it ended up being closer to 6 on my Garmin so I added in a tad more than 1 loop to make it a 10K distance. SURPRISE: I felt awesome and strong, physically and especially mentally. Mile 2 contained Cat Hill, and Mile 4 contained Harlem Hill (oof), hence a bit slower. I am most proud of mile 5, that annoying stretch of rolling uphills on the west side after you come down Harlem Hill counter-clockwise; I kept the pace pretty consistent and mentally worked through that mile. The last mile had some fair downhill so the 6:17 is a bit ‘misleading’ than if it was hillier or even flat but I’ll take it. Just makes me wonder, how can I have low iron when I can bang out workouts like this? During my last bought, I could barely hold a 8:00 pace. Last night was a really strong, solo effort for me. It really boosted my confidence going into the NYC Half-Marathon, like my workout 2 weeks ago did. Maybe last week was just a bout of overtraining coupled with poor recovery? I am happy I took 2 rest days last Friday and Saturday, and took it easy with a 4-miler on Sunday. I guess we’ll just have to wait for the results of the bloodwork. Maybe nothing is wrong with me. I guess that wouldn’t be the worst thing in the world now, would it? 🙂 Just wish there was a reason why I haven’t been 100%. I am going to Chicago for a quick work trip on Sunday and Monday, so I’m trying to use up any food left in my fridge before it goes bad. I had mushrooms that weren’t looking so hot, so I threw them into a “use what you have” stir-fry with quinoa for dinner tonight. 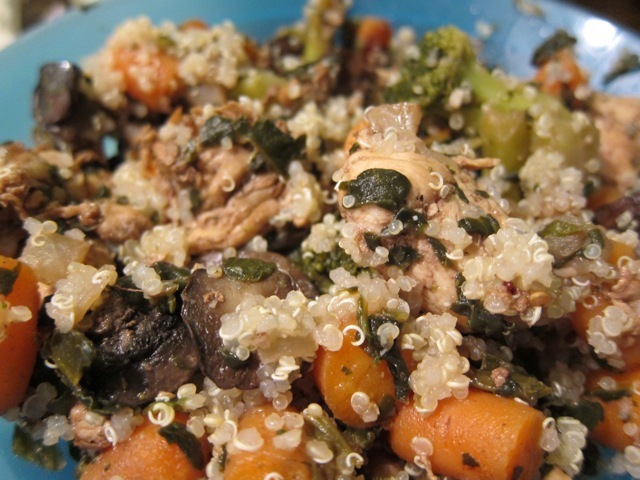 Then, I tossed it together with some cooked quinoa! When I make ‘stir-fry’ dishes like this I tend not to measure much, I just kinda toss what veggies I have (mostly frozen) with some flavor (garlic, onions), add in a protein (chicken, steak, tofu, potstickers, etc. ), simmer in a sauce (usually teriyaki, actually), and serve it over rice or grains. Today I mixed it up with a bit of red wine to add flavor, admittedly from a super-old, already opened bottle of Cabernet Sauvignon. Using what I have! The thing I love most about stirfry-type dinners like this is how quick they are to make, and how easy it is to amp up the veggies in your meal. I would probably not eat this amount of veggies on the side for dinner so incorporating everything into a main dish is key for me to get the good stuff in. But no dinner is complete without one a few of these! How did you surprise yourself this week? What are your “go-to” ingredients in a stirfry-type dinner? I am always looking for more variety! ← Low Energy, Low Iron? Where did you get the Oreo?? I’m not that big on them, but that looks delish. (My faves are actually the vanilla bean “Joe Joe’s” at Trader Joe’s). They are from a chocolate shop in NJ, got them for Valentine’s Day (and are still good!!) I also love Joe Joes, the candy cane ones around the holidays are the best. I do take a daily multi-vitamin, though it does not contain iron, Centrum Chewables. I supplement with iron separately in the morning and at night, so definitely get my iron fix in other ways. My multivitamin also contains a bit of calcium which actually blocks the absorption of iron! I take my iron in liquid form with vitamin c to increase absorption. Definitely a big fan of multi-vitamins, though! You’re so speedy! 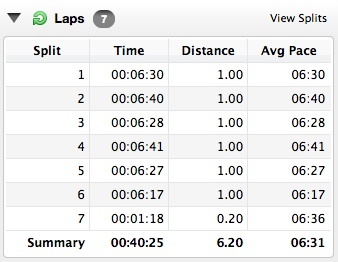 That’s an awesome tempo run, especially in hilly Central Park! I have a great stir fry recipe with peppers, snap peas (!! ), scallions, and cashews…sometimes I throw pineapple in too. 🙂 Delicious! Oooo, I love mixing fruit into dinners where I can, and find pineapple is especially awesome in teriyaki sauce recipes. I will have to try snap peas next time! I heart throwing in random veggies (and sometimes fruit!) into stir fries. Mushrooms, cauliflower, snap peas, bell peppers. All delicous. 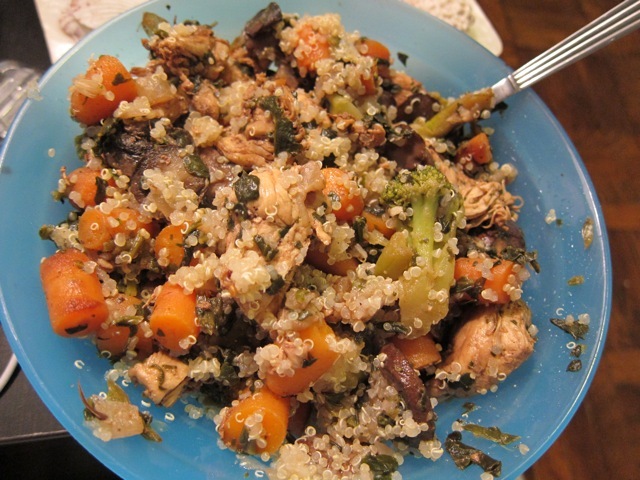 Some fresh rosemary added to this combo ith quinoa and grilled chicken is one of my fav pre-race dinners. i love when use what you have recipes are still just as good! 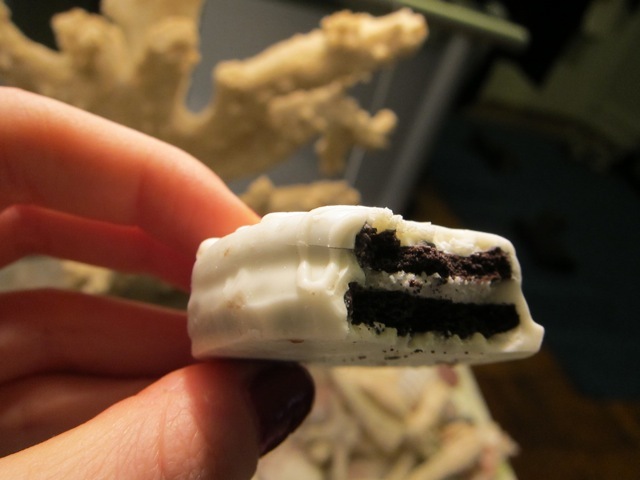 🙂 and that cookie – oh.my.god, how have i not known about this?!?! that run looks awesome!! glad you felt better to knock one out! Healthy Kidney 10K Recap « Run, Lindsay, Run!